When selecting cremation over full body burial or entombment, what many people do not realize is that there can be funeral services and ceremonies when cremation is chosen. Cremation actually increases the options available to you. It in no way eliminates the funeral. Cremation is simply the process of reducing the body to bone fragments through the application of intense heat. Because cremation is an irreversible process and because the process itself will eliminate any ability to determine exact cause of death, the State of Illinois, as well as most states, requires that each cremation be authorized by the local county coroner or medical examiner. Some states have specific minimum time limits that must elapse before cremation may take place. We will advise you of applicable regulations, if any. 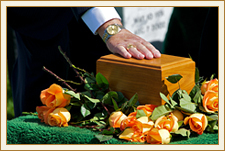 With cremation, you have all the funeral service selections as you have with a traditional burial or entombment. First, you would select what type of funeral service or ceremony you desire: a public visitation (wake) with a ceremony in our funeral home or a church; a private family viewing with or without a ceremony in our funeral home or a church; a memorial service with or without the cremated remains present. Just like with a traditional burial/entombment, families can choose to have a visitation and church service with the body present. This provides an opportunity for relatives and friends to gather and provide comfort and support to one another. A service would follow the visitation either at the funeral home or at a church. At the completion of the services, the casketed body would be taken to the crematory either privately or sometimes in a formal procession. This option is the same as above, except the visitation is designated only for the immediate family and their close invited friends. The ceremony, whether at our funeral home or a church, can be private or public. If there will be no ceremony, it is an opportunity for the family only to see their loved one for the last time and say their good-byes. It is also to be an identification process for the funeral home before cremation. 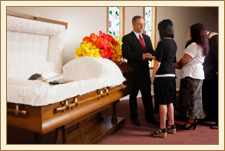 A memorial visitation (service) offers all of the options a visitation, without the body present. Typically, a memorial visitation can be from one to three hours and can be held in our funeral home or celebrated with a Mass or service in a church setting. With cremation, some families choose to have the cremains present for the memorial visitation in an urn. Depending on the type of service you select, there are different merchandise options for you to select from. Select a Container: The container selected depends largely on the type of service and viewing you desire. Basic Cremation Casket: Suited to simpler tastes or a private viewing prior to a cremation. Alternative Container: Suitable when there is neither a viewing nor visitation. 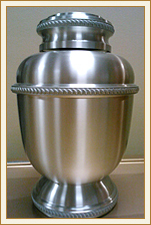 Select an Urn: What do you want to do with your loved one’s cremated remains after cremation? Inter them in a cemetery plot or entomb in a mausoleum niche? Memorialize them in a decorative urn? Scatter them in a special place? The answers to these questions help determine the urn that best fits your needs. We have a vast selection of urn products and services for you to choose from. We carry a number of memorial keepsakes to help honor the life of your loved one while creating meaningful memories. As you complete your cremation funeral planning, you may also wish to consider keepsake urns, jewelry and specialized engraving that provide you a lasting remembrance of your loved one. Ask about our Thumbies® Fingerprint Keepsakes. We will help you analyze all of your choices and see how they best fit your particular situation and will be glad to answer any questions you may have.